This is for a sweet little boy born to a wonderful couple that we know in our other home in Kansas. 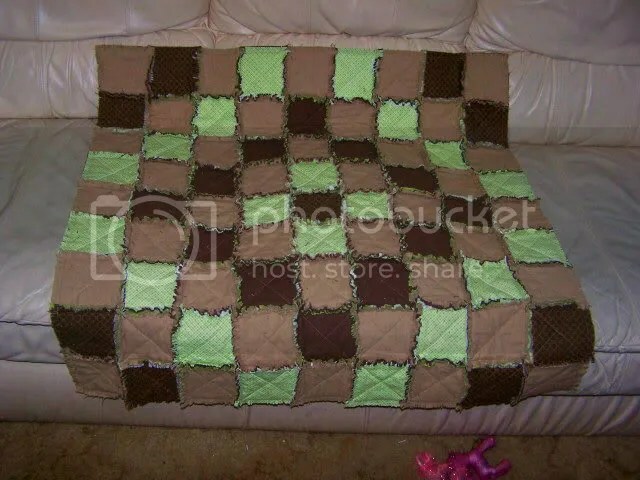 These are the colors in his nursery, and they had me craving mint chocolate chip ice cream while I worked on it! I had so much fun deciding on the patterns on the front and back. 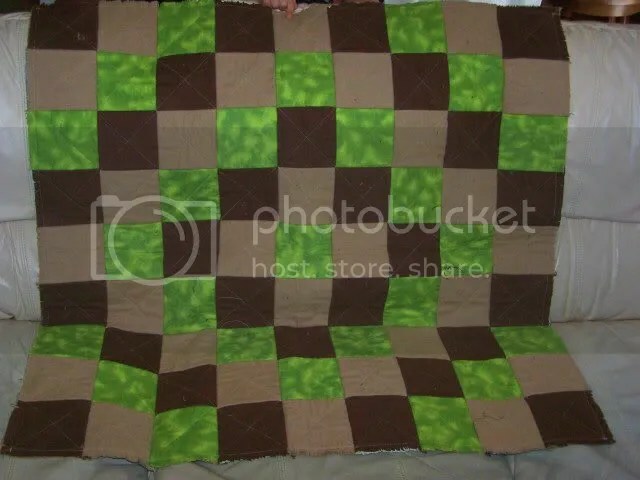 It still needs to be washed, and that should fluff up the seams nicely. I’ve been told to wash it in a heavy-duty commercial machine at a laundromat rather than my home machine, since the amount of strings and lint from all of the clipped seams will be extreme. It’s not easy to find time to hang out at a laundromat, so I haven’t finished that step yet. When I do, I’ll try to post a new pic before this project wings its way to Kansas. I’m so pleased with it. 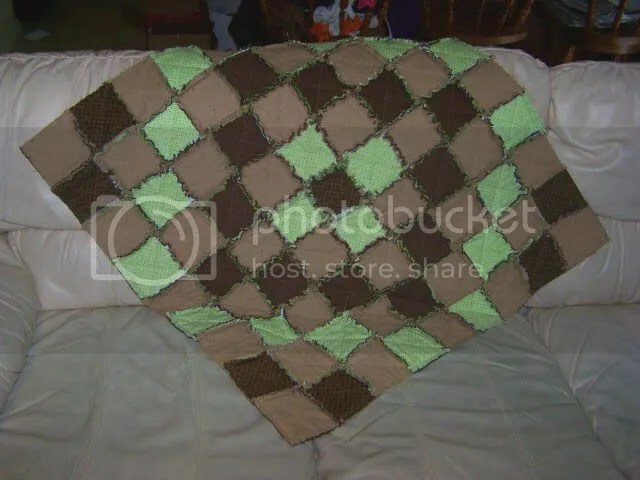 It should be a nice size either for a handy snuggle blanket or a play mat. I hope baby George enjoys it! Our precious Bunny has her third birthday today! When she was born, we never could have guessed what a delightful, hilarious, cuddly girl she would turn out to be! She says adorable things like cupcape, strawbeberry and bellella (umbrella). She is almost the size of her 5-year-old sister, and on track to be almost 6 foot tall. She loves to sit on my lap and cuddle, play with dollies, go to the park, and paint. She is also one of the funniest children I have ever seen! One of her favorite things is to help me with baking or cooking. This is one of my absolute favorite pictures of her. 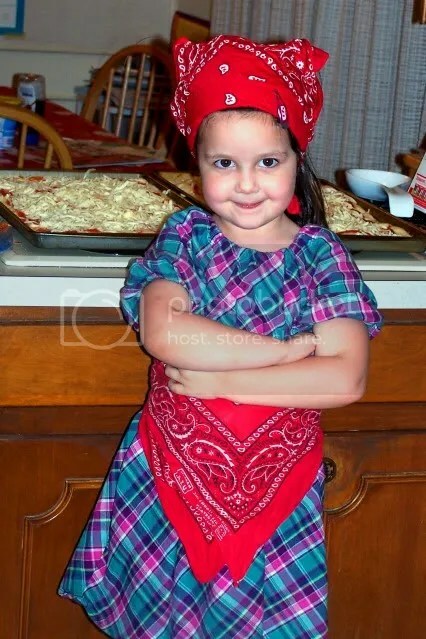 She was helping me make pizza for dinner, and brought me two bandanas and asked me to make them into a hat and apron. 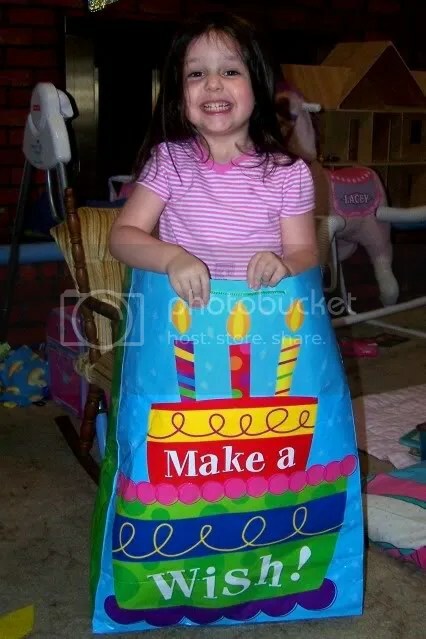 I made her a hat and apron of her own as a birthday present. Since Cricket got one for her birthday in November, this wasn’t a big surprise. Bunny loved choosing the fabric, and it didn’t bother her at all that it wasn’t a surprise! 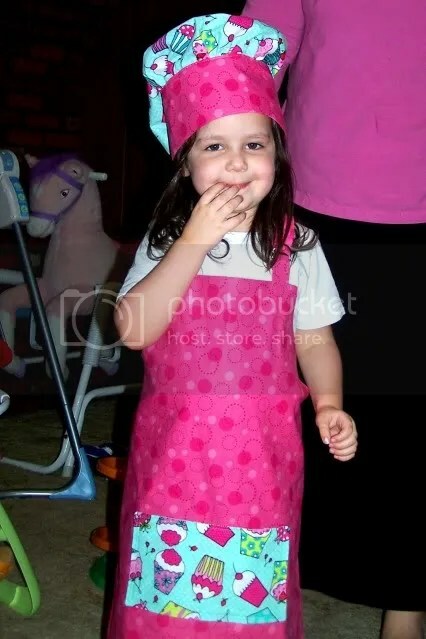 The apron is reversible, so the other side has cupcakes with a pink pocket. 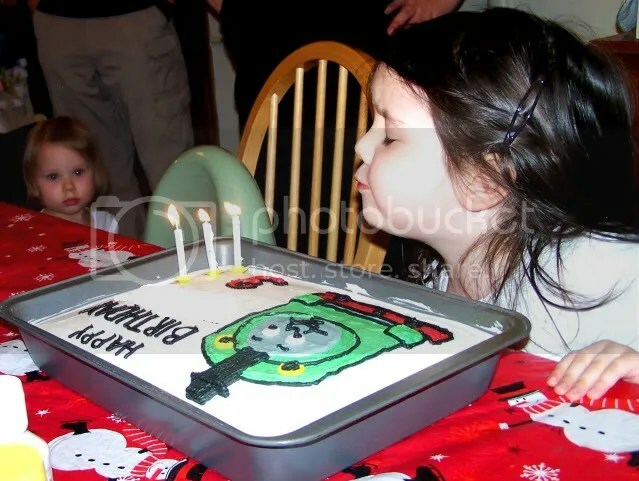 She is a big fan of Thomas the Tank Engine, and Percy is her favorite. I usually do a frozen buttercream transfer, but didn’t have enough time for that this time, so I just drew freehand. The trains are pretty geometric, so it wasn’t all that hard. 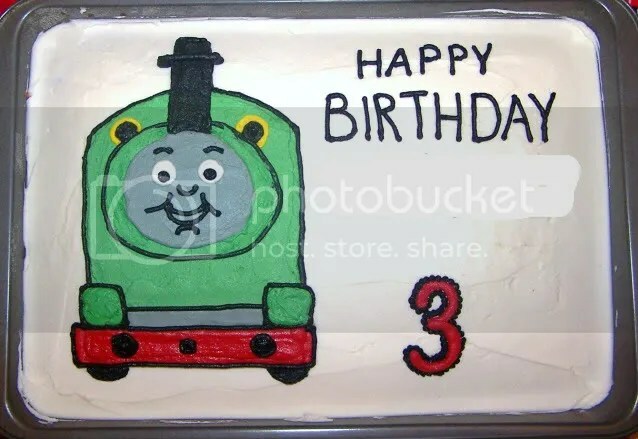 It ended up being a good thing that I didn’t stay up late to work on it, since she changed her mind about what she wanted on the cake between going to bed and getting up in the morning. Why can I draw better with a piping bag than I can with a writing utensil of any kind? I managed to do this in the midst of other birthday preparations with three munchkins, so I’m happy with it even though there are things I’d like to have done better. As you can see, Bunny liked it, too! 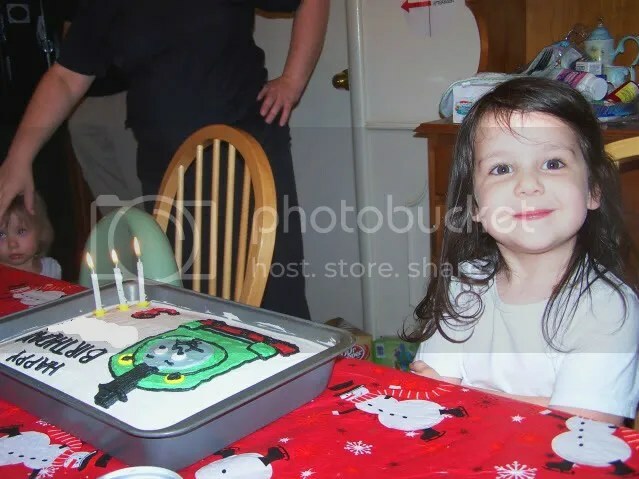 She loved blowing out her own candles! My brother-in-law started by asking her “How old are you, 10? 12?” To which the ever-wise Bunny said “YEAH!” For the rest of the night, all of the careful practicing we’d done was out the window as she told everyone she was twelve while holding up her three chubby little fingers. Happy, Happy Birthday to my darling Bunny! I’m so glad that you were born, and incredibly thankful to be your Mama!